Casey Benjamin’s inspirational charm depicts the hamsa, an amulet that wards of negative influences. Two-time cancer survivor Casey Benjamin believes that the jewelry you wear every day can bring "good juju" into your world. 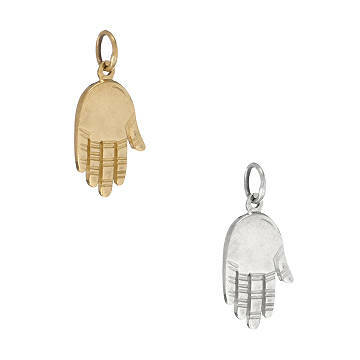 Like this hand-shaped charm depicting the hamsa, a traditional Middle Eastern amulet offering protection. Believed to ward off negative influences, it's a beautiful bit of "armor" against bad vibes. Charm: 3/4" L x 3/8" W Chain: 18"